Kami has a free version, and a paid version for educators. 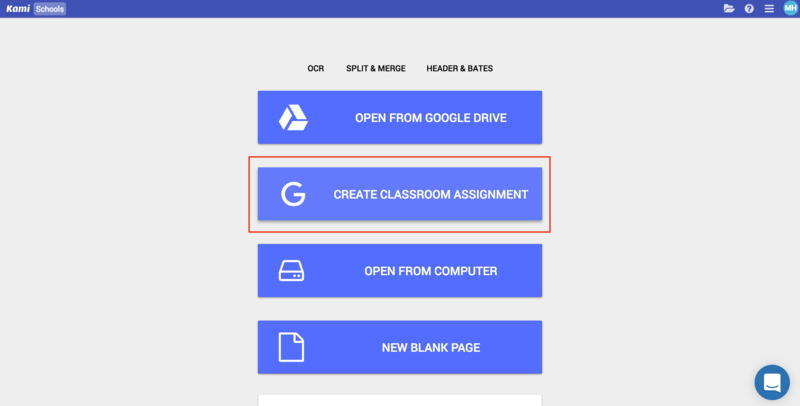 This article shows how to use Kami with Google Classroom on the paid version. 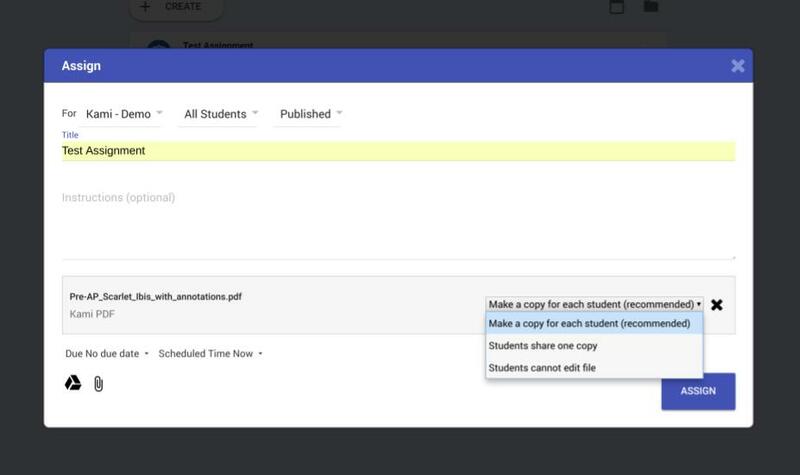 The paid version includes deeper integration to Google Classroom, such as built-in "Turn In" button, and assignment creation. These upgrades substantially improve the usability of Kami with Google Classroom, for example, the "Turn In" button prevents students from turning in the wrong file. The first you need to go to the "Classwork" tab in your Classroom course, then click the "Create" button in Classroom, and then select "Kami assignment" from the list of options. The second is to open the front page of the app and select the "Create Classroom Assignment" button. Either of these options will take you to the assign screen, which looks similar to the Google Classroom assign screen. You can create a title, add instructions, and attach a file using Google Drive or a local file. This will create an assignment within Classroom as well. We recommend selecting "Make a copy for each student" (selecting "Students share one copy" means they will all be annotating the original). The students can open the file directly from Classroom into Kami. If the students have the Google Chrome extension installed, they can open the file into Kami directly from the preview window. After opening the file, the student can turn in the assignment directly into Classroom from Kami. To turn in the file, the student can click the "Save" button in the top right corner and then select Turn In. This will force save the student's annotations and turn in the assignment into Google Classroom. The main advantage of this feature is that it cuts down the steps needed to turn an assignment in. For example, students no longer need to manually save their annotations or worry about Kami's dual saving system.